Chernecky CC, Berger BJ. 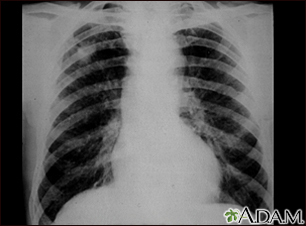 Chest radiography (chest x-ray, CXR) - diagnostic norm. In: Chernecky CC, Berger BJ, eds. Laboratory Tests and Diagnostic Procedures. 6th ed. St Louis, MO: Elsevier Saunders; 2013:327-328. Felker GM, Teerlink JR. Diagnosis and management of acute heart failure. In: Zipes DP, Libby P, Bonow RO, Mann DL, Tomaselli GF, Braunwald E, eds. Braunwald's Heart Disease: A Textbook of Cardiovascular Medicine. 11th ed. Philadelphia, PA: Elsevier; 2019:chap 24. 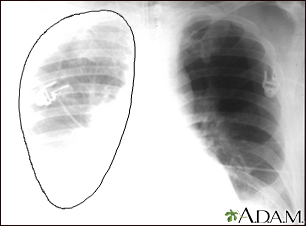 This chest x-ray shows coal worker's lungs. There are diffuse, small, light areas on both sides (1 to 3 mm) in all parts of the lungs. 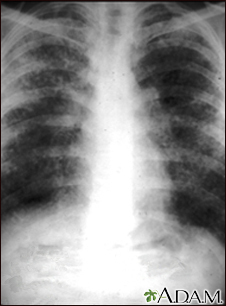 Diseases that may result in an x-ray like this include simple coal workers pneumoconiosis (CWP) - stage I, simple silicosis, miliary tuberculosis, histiocytosis X (eosinophilic granuloma), and other diffuse infiltrate pulmonary diseases. 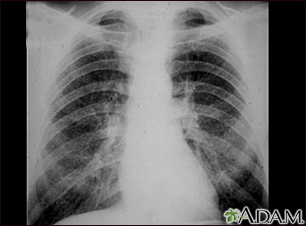 This chest x-ray shows the affects of a fungal infection, coccidioidomycosis. 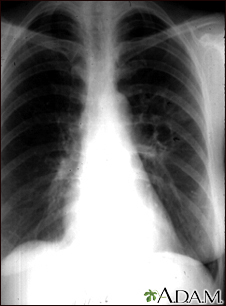 In the middle of the left lung (seen on the right side of the picture) there are multiple, thin-walled cavities (seen as light areas) with a diameter of 2 to 4 centimeters. To the side of these light areas are patchy light areas with irregular and poorly defined borders. 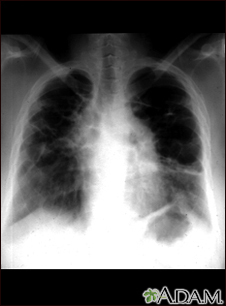 Other diseases that may explain these x-ray findings include lung abscesses, chronic pulmonary tuberculosis, chronic pulmonary histoplasmosis, and others. 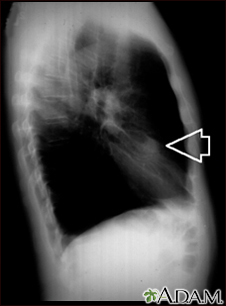 This chest x-ray shows stage II coal workers pneumoconiosis (CWP). There are diffuse, small light areas on both sides of the lungs. 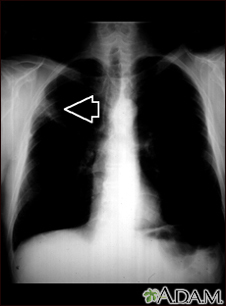 Other diseases that may explain these x-ray findings include simple silicosis, disseminated tuberculosis, metastatic lung cancer, and other diffuse, infiltrative pulmonary diseases. This picture shows complicated coal workers pneumoconiosis. There are diffuse, massive light areas that run together in the upper and middle parts of both lungs. These are superimposed on a background of small and poorly distinguishable light areas that are diffuse and located in both lungs. 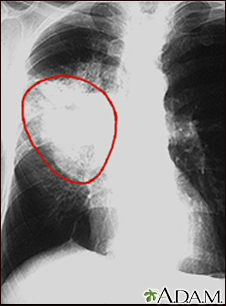 Diseases which may explain these x-ray findings include, but are not limited to complicated coal workers pneumoconiosis (CWP), silico-tuberculosis, and metastatic lung cancer. 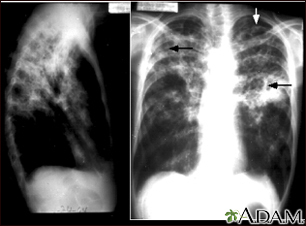 Tuberculosis is an infectious disease that causes inflammation, the formation of tubercules and other growths within tissue, and can cause tissue death. 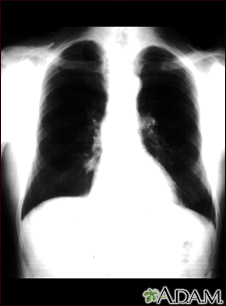 These chest X-rays show advanced pulmonary tuberculosis. There are multiple light areas (opacities) of varying size that run together (coalesce). Arrows indicate the location of cavities within these light areas. 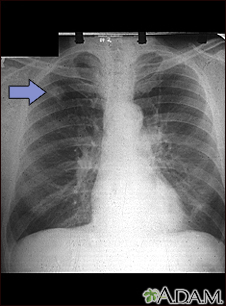 The X-ray on the left clearly shows that the opacities are located in the upper area of the lungs toward the back. 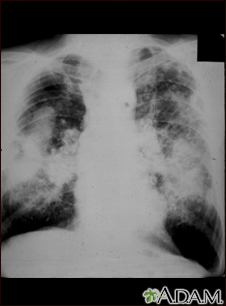 The appearance is typical for chronic pulmonary tuberculosis but may also occur with chronic pulmonary histiocytosis and chronic pulmonary coccidioidomycosis. Pulmonary tuberculosis is making a comeback with new resistant strains that are difficult to treat. 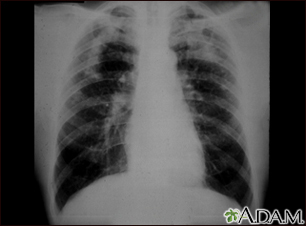 Pulmonary tuberculosis is the most common form of the disease, but other organs can be infected. 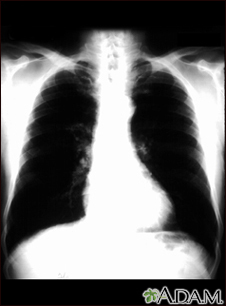 This is a chest x-ray of a person with bronchial cancer. This is a front view. The lungs are the two dark areas. 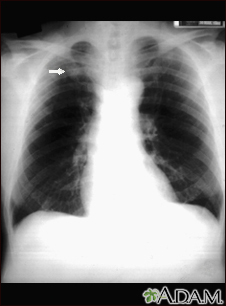 The heart and other structures are white areas visible in the middle of the chest. The light areas that appear as subtle branches extending from the center into the lungs are cancerous. 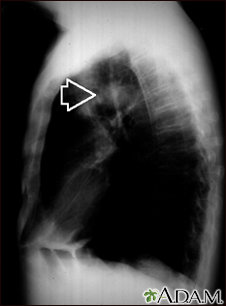 This is a chest X-ray (CXR) of a nodule in the right lung. 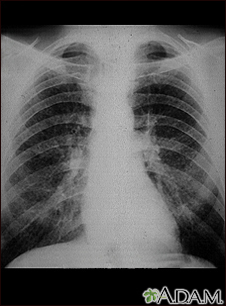 This is a chest X-ray showing mass in the right lower lung near heart (seen on the left side of the picture).